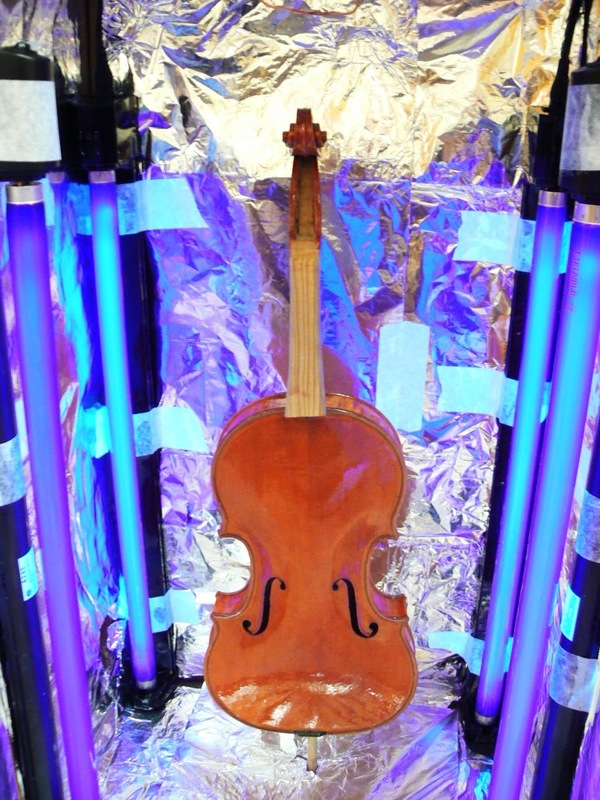 Is that a violin in that box...? When a violin is being varnished, the varnish needs to dry. The best thing to dry varnish with is sunlight and fresh air, which is why Stradivari had a little alcove on top of his house where (presumably) he hung the instruments to dry while continuing to work down below. Enter the drying booth! A modern convenience for violinmakers everywhere. 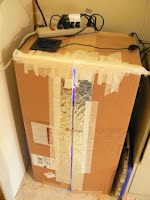 It may look like an innocent cardboard shipping box, complete with UPS label on the side. But open it up, and.... surprise! This made me smile, I love it! 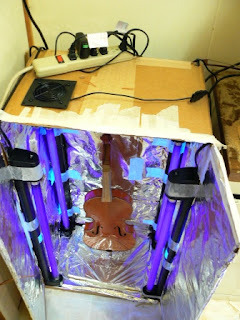 Engineering, innovation, fluorescent lights, an old box and a computer fan combine in a mission to complete a violin. What could be better? Looks like a freaking insurance calamity to me. And don't worry, Bill. The fan is there to keep things cool, but even without it the temperature inside the box is well below flashpoint, even for cardboard. It does get warm enough, though, to impede the drying of the varnish.